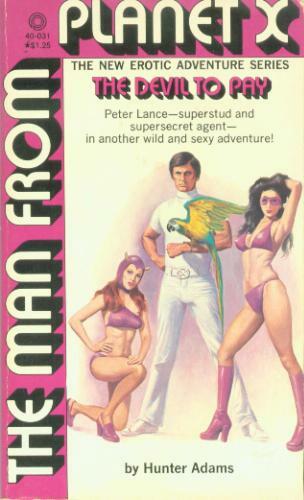 The title is formatted as The Man from Planet X: The Devil to Pay on the front cover, title page, and spine. However, it's clear from page  that "The Man from Planet X" is the name of the series and so this was not included in the publication title. Assumed first printing that states "First printing, August 1977 / Printed in the United States of America." There is no number line or other printing number indication. The catalog # is 40-031 on the front cover, 523-40031-9 on the spine, and "ISBN: 0-523-40-031-9" on the copyright page. However, the ISBN check-digit is incorrect. The ISBN should have been 0523400314 / 0-523-40031-4. A search finds that some dealers are using the corrected ISBN and it's believed they have this publication and corrected the ISBN rather than posting a listing for 0-523-400-31-9.